ETFs that track the S&P 500 reflected the downturn as SPDRÂ S&P 500 ETF (NYSEArca: SPY) was down 0.50%, iShares Core S&P 500 ETF (NYSEArca: IVV) was down 0.49%, and the Vanguard S&P 500 ETF (NYSEArca: VOO) was down 0.48%. Tensions between the U.S. and China have been brewing as the Trump administration have been cracking down on trade practices that it deemed unfair. The Trump administration was already amidst an escalating trade conflict with Canada, Mexico and members of the European Union after Trump imposed tariffs on steel and aluminum. Related: Trump’s Tariffs Just a Negotiating Ploy? 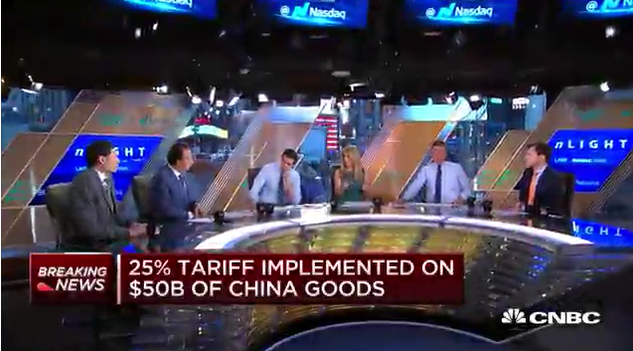 As expected, China did not take too kindly to the tariffs, but overall, the actions by the Trump Administration did not come as a complete surprise. “We will immediately introduce taxation measures of the same scale and the same strength. All the economic and trade achievements previously reached by the two parties will no longer be valid at the same time,” said China’s Commerce Ministry in a statement to CNBC. For more news affecting equity ETFs, click here.